Okay, y'all. This recipe seriously kicked my bum. It's one of the first of The Thrifted Kitchen that I've tried and in the end used the words "epic fail" (the hubs can vouch for me). I made this recipe not once, but twice, and both times the dough turned out way too crumbly. I decreased the amount of flour the second time around, but only one of the four colors had a roll-able consistency; the rest just crumbled at the touch! 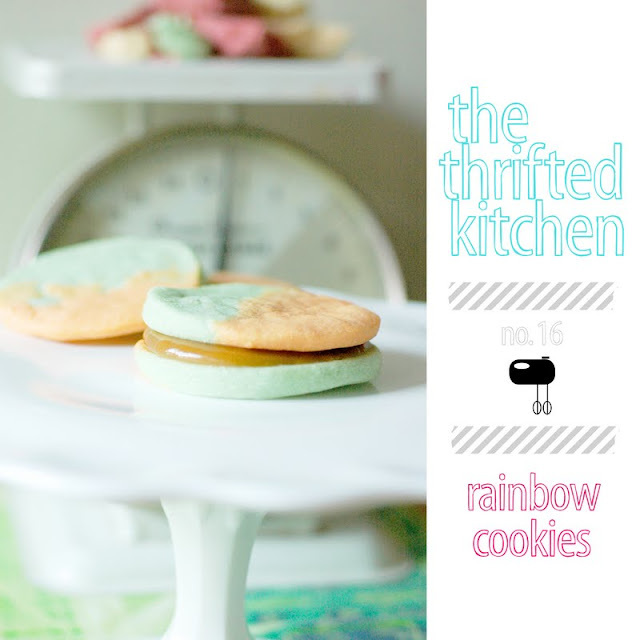 In the end, I was able to scrape together four lonely cookies that have a two-color rainbow, which is such a shame because I mixed this beautiful mauve color that I couldn't use! I'll go ahead and post the recipe in case you all feel like giving it a whirl. And if you figure out the magical combination of butter, powdered sugar and flour that leaves you with malleable dough, I would so appreciate your hopping back over here and letting me know the secret! 2 1/2 cups sifted Pillsbury's Best Enriched Flour gradually. dough into four parts. Color one part red, one yellow and one green by adding 4 drops French's Food Coloring to each. Blend color into dough thoroughly with spoon or knead in with hands. Leave fourth portion uncolored. You will have four portions of dough, each a different color. one-fourth of each color dough into a long strip 1/2 inch thick. Place the four strips side by side on floured pastry cloth or board. lengthwise into a long strip 2 1/2 to 3 inches wide and 1/8 inch thick. 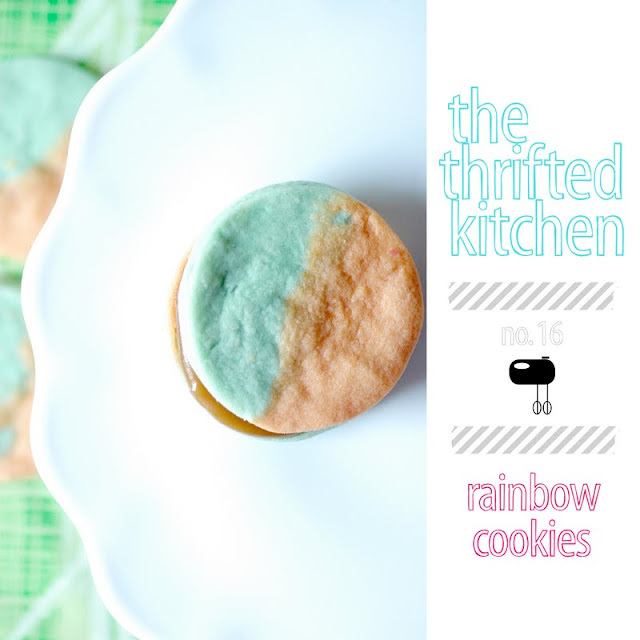 Cut into rounds with 2-1/2-inch cookie cutter so that each cookie has four colored stripes. this process three more times, using remaining dough. Reroll all extra pieces of dough together to 1/8 inch thickness and cut into rounds. Cookies made from this dough with be marbled. Place on greased baking sheets. in moderate oven (350 degrees) 8 to 10 minutes. Do not brown. Cool. Place cookies together with peanut butter filling, sandwich-style, if desired. Or serve cookies plain. Store in tightly covered container. Combine 1/3 cup brown sugar and 1 tablespoon flour in a saucepan. Add 1/2 cup water. Cook over medium heat, stirring constantly, until thickened. Remove from heat; add 1/4 cup creamy-style peanut butter. 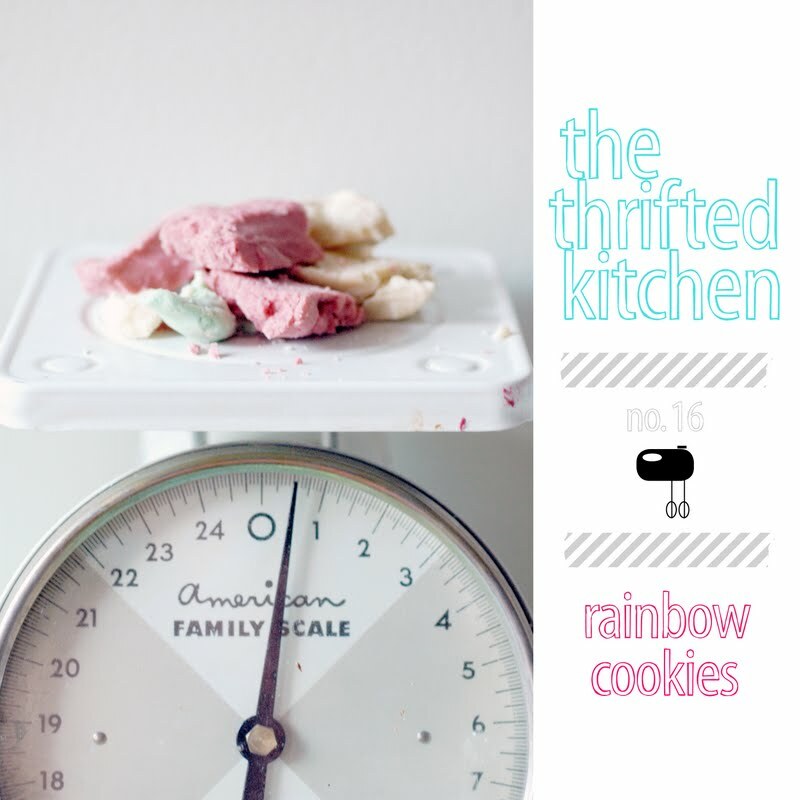 Use 1 teaspoon between each pair of cookies. Directions don't mention chilling the dough before rolling. I would think that would be critical. Makes a pretty cookie! Congratulations on being nominated for the Country Living Blue Ribbon Blogger Award! I'm Pam from One Gal's Trash...one of your fellow nominees, and a kindred junky spirit. Beautiful blog! Lovely cookies and as usual beautiful pictures. So real you want to reach out and grab one. Yum! Congrats on nomination. I am so very proud of you. You are deserving for your talent.